I just picked up these Monarchy class A mono-blocks and I've been playing them all weekend on my Polks. Listening impressions are quite favorable. The little guys are only 70 wpc but it's class A so I'm thinking that's why they drive the Polks so surprisingly well.They do have better bass than the monster Mac's they're sitting on and at less than 1/10th the power that surprised me. They also are great little heaters as they both run at a steady 120 degrees. I originally got them to power my khorns but I figured I give them a shot at the Polks to and I'll be darned if I wasn't pleasantly surprised. Beautiful set up you have there. Not seeing it, but I'll assume there's a dreadnaught tucked in the rack? I see a pair of Mac monos up for sale soon. Thanks; it keeps me out of trouble or sometimes gets me into it. Oh yes there's dreadnaught on the bottom shelf tucked behind the Mac light. Actually Jesse the Mac's were up for sale for the past week but I didn't find a buyer. Of course I didn't try really hard either. 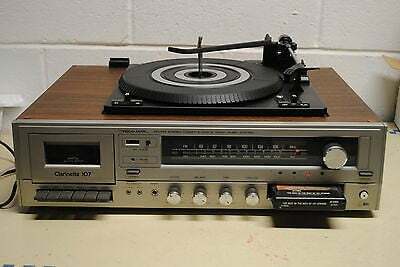 I had a line on a pair of Mcintosh MC1201's and that's what I really wanted. My consolation prize are these little Monarchys. Super cool stack of goodies. 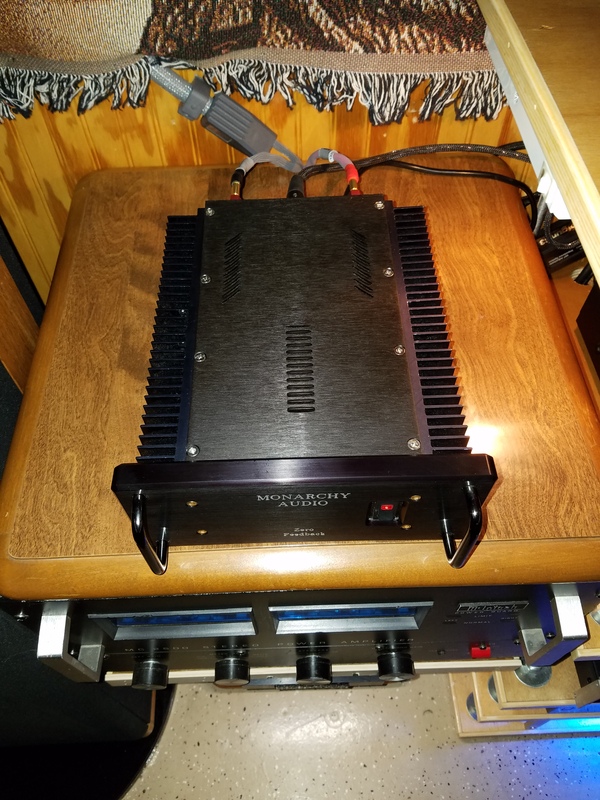 Thanks; these are my first modernish (this century) amps that I've had on the Polks and the first pair with balanced inputs as well. For 90% of my listening surprisingly to me these Monarchys would do just fine. I thought for sure they would fall on their face given their low output much in the same way my 60wpc tube integrated did when asked to drive the 1.2tl's. But I was wrong. Very nice setup. 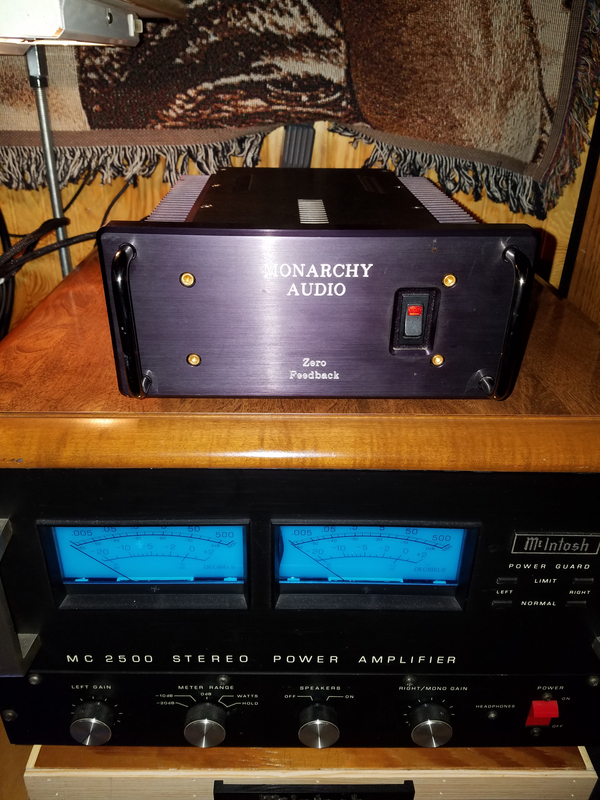 I have a pair of Monarchy 100 Class A Monoblocks on my Ushers. They sound really sweet. I have never ran them with my 2.3 TL's though. But I have also used the Monarchy's with some KEF 105/2's and Klipsch CF3's and they were very impressive. Alrighty then I'm glad to know I'm not the only one here with a pair of Monarchys. 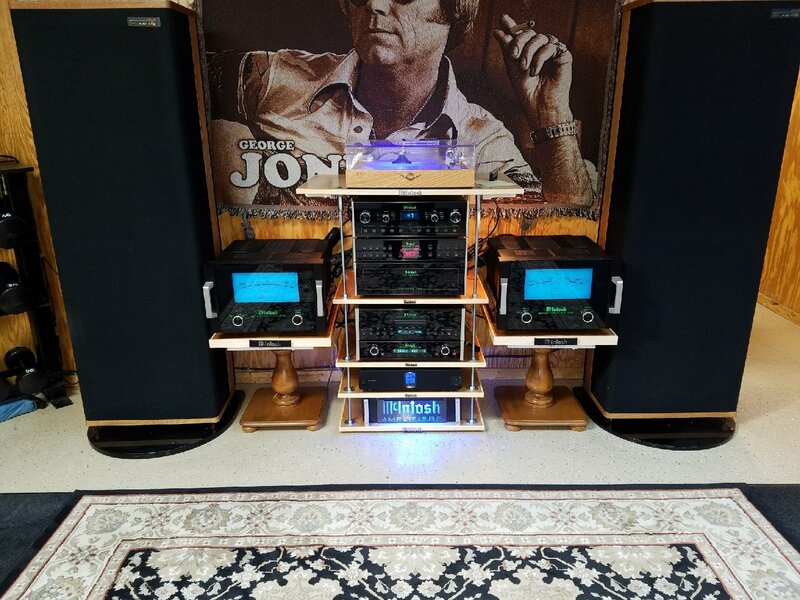 I can bet they sound great on all your speakers; why haven't you tried them on your Polks? 100wpc of Class A should really light them up. 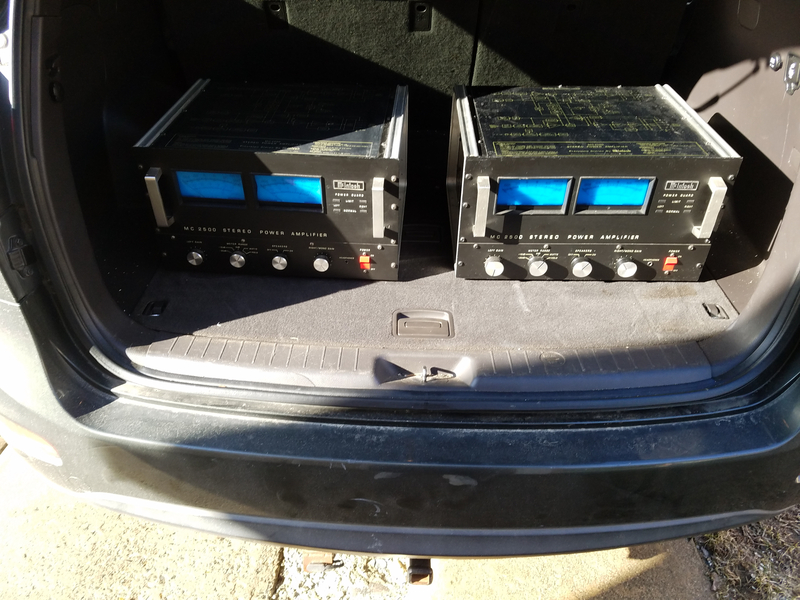 You were right Jesse; Here they are in back of my suv on their way to a new home hopefully tomorrow. Those Monarchy's take over for powering the polks? Just for tonite; I'm in hopes of bringing home something a little bit more refined than the 2500's tomorrow. the listening impressions are very favorable. WOW THAT OUGHTA DO IT!!!! very nice i would love to hear them. Yep. That should do it! Somebody got a bigger hammer. Lol and yes pics don't do them justice; they're huge almost to the point of being ridiculous just like the rest of the amp. The piece of glass covering them is a half inch thick and the amp's 148lb weight made moving them alone a challenge to say the least. 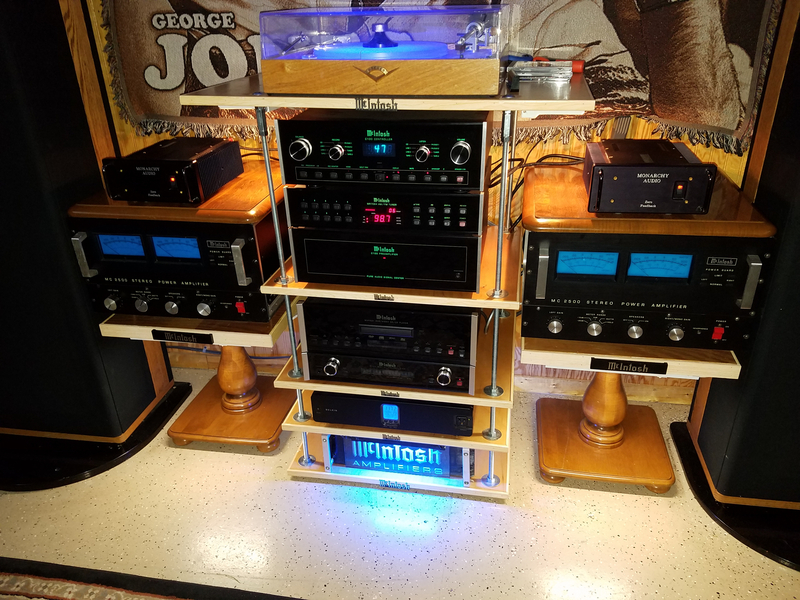 Those amp stands are screaming for an upgrade. So did you install eyebolts in the ceiling for the block and tackle to drop them in place? I agree and the other electronics deserve a better rack as well. Neither are in the budget right now lol. No block and tackle. Just my tired 62 year old back wrestling them into place alone. The good thing is I didn't have to load them into the back of the car. All I did was supervise the 2 younger guys. Don’t think I would trust those pedestals with 150lb McIntosh amps. Congrats on the magnificent amps. Thanks; Well they held my 129lb Macs for 3 years with no problems. Just to be sure there'd be no problems with the new ones I bounced my 200+ carcass around on them with no damage. They're also secured to wall. 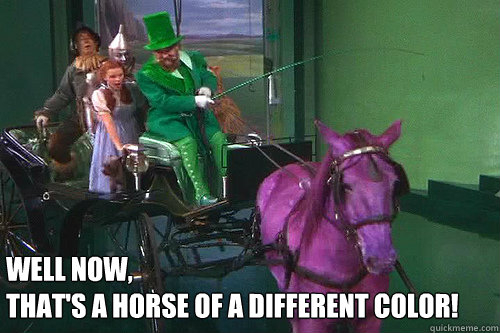 Well now, that's a horse of a different color! If you ever want to compare those with both 1.2s and 2.3s, don't be afraid to throw them in your carry-on and fly up to Vee Tee. ^^^^^Haha; I'm hoping I never ever have to move them again. Concert Grands take the cake as the worst speakers I've ever had to move and these amps are the worst electronics to ever make my back sore. They came from southern NH; not too far from "Vee Tee"
I have a 50-pound tube amp and when I try to move it, it feels like there are otherworldly gravitational forces at play. I can't even imagine what those beauties are like to lift.